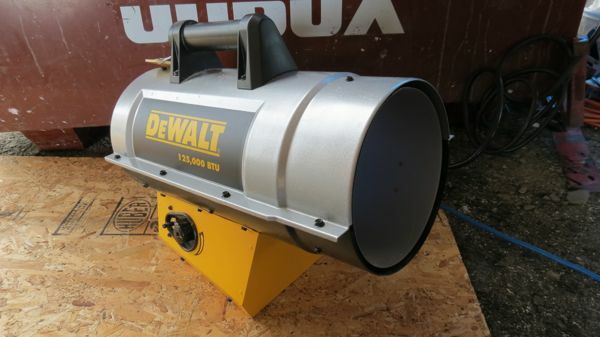 In most parts of the country, heating becomes a major issue for new construction projects in the winter and portable heaters fueled by propane are generally the most viable solution. However, there are obvious safety concerns when using large, high-BTU, portable heaters—there is potential for harm to the structure you're building and the people who are building it if the heaters are not properly used. Do have heaters inspected, tested, and repaired if necessary by a qualified LP-Gas technician prior to the heating season. Do keep propane tanks upright, at least six feet from the actual heater, and on a firm, level surface. Don't use heaters in an area where they may easily ignite combustible materials (e.g., paint, paper, or plywood). Don't place a heater directly on a plywood floor -- position it instead on a 4-foot by 4-foot square of fire-resistant drywall or cement-board. Do protect all hoses from physical damage and exposure to excessive heat. Avoid running hoses through a doorway, as a closed door will pinch the hose, thereby causing potential damage to the hose and improper gas flow to the heater. If a hose runs through a window, make sure to put a block on the sill to prevent the window from closing on and pinching the hose. Don't operate a heater in an unventilated area. Always crack a few windows (on the second floor, where possible) to evacuate excess accumulation of fumes and heat. Don't use site heaters in a manner for which they were not intended (e.g., cooking or warming/drying clothing). For complete safety instructions, always follow manufacturer instructions and OSHA guidelines. You can also call the National Propane Gas Association at 202-466-7200.